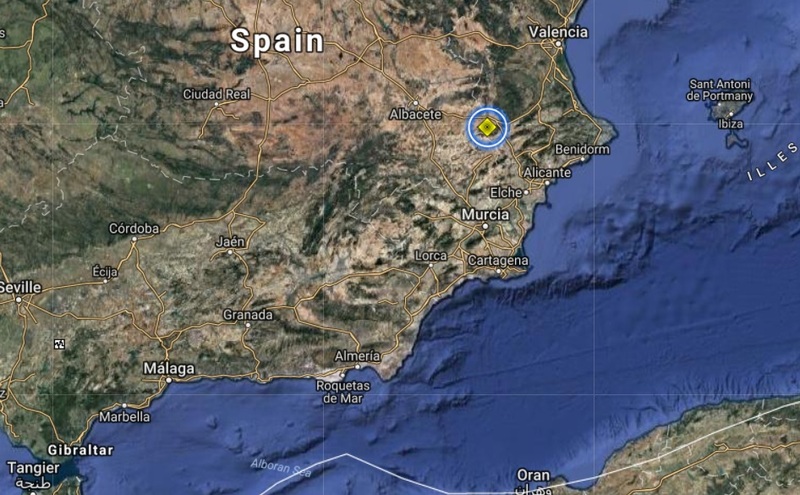 The Big Wobble: Earthquakes in strange places: A magnitude 4.0 strikes near Albacete Spain and is the third quake to be recorded there in the last few days! Earthquakes in strange places: A magnitude 4.0 strikes near Albacete Spain and is the third quake to be recorded there in the last few days! It is an area with almost no historical seismicity but three quakes have been recorded. Todays quake does not show up on the USGS website. An earthquake recorded in Caudete, Albacete, yesterday forced the evacuation of around 1,600 school children, according to reports. Three public schools were reportedly evacuated, the IES Pintor Rafael Requena, the El Paseo school, and the Gloria Fuertes school, as well as a daycare centre, after the quake that registered a 4 on the Richter scale. The quake happened at approximately 9:47 yesterday morning, with all of the schools suffering some form of damage such as broken windows, cracks in the ceiling, and even parts of the ceiling falling down to the floor. In order to evaluate the damage caused, children were evacuated from the schools, although no personal injuries have been recorded. Yesterday's earthquake is the third to be recorded in the province of Albacete in the past few days. Two slightly smaller quakes, registering 3.2 and 2.2, were recorded in Villarrobledo on November 27. Last Saturday the Mediterranean islands of Cyprus and Malta along with northern Libya hit with mid mag quakes with Malta and Northern Libya having almost no historical seismicity.